At a secret location, somewhere between Bristol and bath, wild strawberries grow at the side of the cycle track 8) Found them by chance, spotted them while fixing a puncture. Not much of a meal because wild strawberries are tiny. But what they lack in size and quantity they make up for in taste! Each strawberry is a succulent mini taste explosion! Mmmmm a gourmets delight that makes commercially grown tame strawberries seem completely bland and tasteless in comparison. 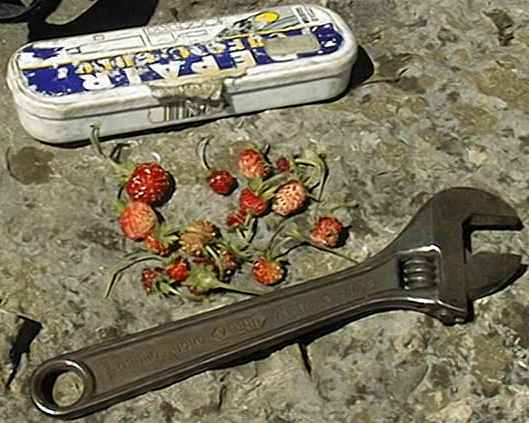 The entire crop is pictured next to a puncture outfit and a six inch adjustable spanner (right handed) to give an idea of scale. Technically my bicycle mechanics tool kit should contain a metric adjustable spanner because most of the nuts and bolts on my bicycle come in metric sizes.